Can't wait for tomorrow. Exciting race with a mixed grid. Overtaking is possible so Max, Hamilton will make places unlike Australia. 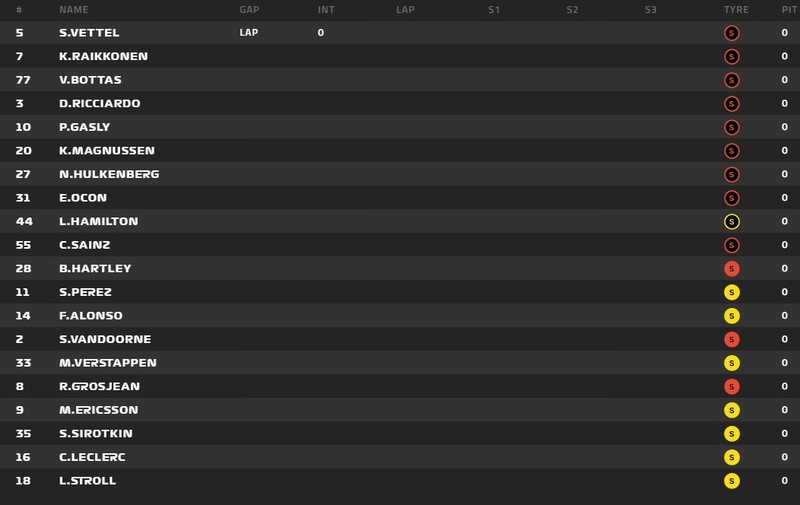 Midfield is also close so 4 to 5 teams will fight for P7to P10. Midfield battle could be a belter between Gasly,K-Mag,Hulk,Sainz,Ocon,Perez,Alo,Stoff and Hartley. RoGro might even join it. I predict carnage, or at least a couple of incidents and some steward reviews. They are all really close in the long runs and there's a few potentially tasty clashes. Could be good at the sharp end but I think Kimi will rear gunner Seb to a pretty straightforward win. Yeah I think Kimi will keep pace with Vettel until the first stops and then fall away. He may be able to hold Bottas up but I suspect Ricciardo may well get by him. But I bet both Ferrari drivers are more than happy that Verstappen isn't starting right behind them! It will be interesting to see how far Hamilton can go on his softs, and whether the Ferrari drivers will come out behind them after they make their stop. I wonder if anyone will try the 2 stop. Mad Max to carve his way through the field. My understanding is the only way to 1 stop is soft-medium. Anyone starting on SS has no chance to 1 stop judging by the pace of the SS which begins losing time quite drastically after 3-4 laps and after 10 laps has dropped off by about 1.5 seconds from its initial pace and slower than the S at that point. They are going to need to take it to at least lap 18-20. Keep in mind that teams have to run BOTH compounds. The second half should be worth watching,especially when the temp drops. With Max claiming the Renault engine has a surprise 150hp that can burst out at any moment, something I'm sure when he said it would have pleased and baffled the engineers at the same time, Red Bull should dominate this one. Don't know. There's an interesting stat which says that hardly drivers outside the top 4 have claimed podium finishes in Bahrain. Have to say I'm really excited for this race... for the midfield, for potential recovery drives from Max and Lewis, for the hopes that Ricciardo and Bottas could do something to challenge the Ferraris. It's been quite a while since I've been this excited for a race. Ferrari is the hare and I feel they'll maximise DRS zones in attack and defence this season. Very cunning, very good. Think Vettel will walk it, particularly with Kimi in support. Expect HAM to run Soft-Medium, hope he can makes some places up, but I won't be betting on him finishing higher than fifth. One hope is that RICs potential race pace brings him in to the fold, but he has to deal with Bottas first. If the Ferrari's come out of Turn 3 in 1st (VET) & 2nd (Kimi), and Bottas in third, they'll be laughing. This race is going to be a complete contrast to the dull Australian Gran Prix. The same action can be expected next weekend in China. I'm really excited for this race. Everything is going great so far this season and we could be in for a thrilling year for the first time in ages. Ferrari at the front is good for the sport and it's time for a world championship. I think it will be Mercedes and Red Bull battling for the final podium position, with Valtteri maybe redeeming himself after Australia by beating Ricciardo. Hamilton has to take big risks I hope he is made to fight for every position gained and nobody just moves over for him thinking it's a pointless battle. I think fifth is his maximum result unless some ridiculous good fortune like safety cars goes for him. I'm really interested to see how McLaren go in the race too after Honda engines beat them in qualifying. It will be interesting to see if Mercedes ask Bottas to move over for Hamilton, should the situation arise. Really early in the season, but looks like they are in for a dog fight this year. They won’t if they have any sense. It’s far too soon to be pinning all hopes on one driver who, as Nico points out, can go missing for entire weekends. I'd assume Merc will try and get the pass done during pitstops with Hamilton's differing tyre strategy. You'd assume they'd want Hamilton in front, but don't want to have to ask Bottas to move with their allowing drivers to race policy. But Toto did say on a channel 4 interview that they hope for 3rd and 5th, of which I assume the 3rd to be Bottas. So it's really up to Bottas to not mess up if he wants to finish ahead of Hamilton. Think I already see more advertising on the halo's to Oz - didn't take long to sell that space on the cars! Dammit Max.... and Riccardo now stopped.... AMRBR doing a Haas! You could Max put the throttle on in the middle of Turn 1, ridiculous driving. I expected Hamilton to get out the way, and then take tkthe radio and complain. No luck, Max.. I guess he wanted to make a point. I have to say, I am getting the Juan Pablo Montoya vibes from Max. Awesome driver, very aggressive, but makes a lot of silly mistakes. More like Max squeezed Hamilton off the track... or tried to and didn't expect Hamilton to fight back. Verstappen did what every driver does when overtaking now. Run the guy on the outside off the track. Hamilton did what I wish all drivers would do. Just not move over. We've seen about 5 drivers push others off the track already. That wasn't DRS was it? Not first lap after VSC?